Using paper cups is something we should not do and specially not when you can have a travel mug that looks amazing. 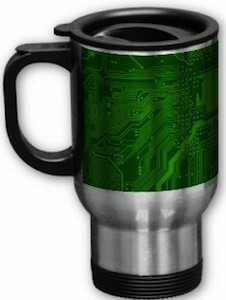 This stainless steel travel mug has a chrome background and the top part of the mug has a print of a circuit board on it. And that of course makes it super fun for computer nerds and geeks. 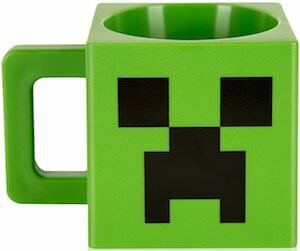 The mug offers 15 oz of space and can be used everyday and that saves a lot of paper cups. So if it’s time for coffee check out this Circuit Board Tavel Mug. Drinking your mornings first cup of coffee will never be the same if you do it in this Angry Birds mug. 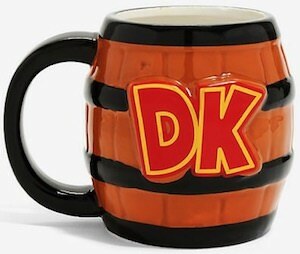 This ceramic mug is white on the inside and red on the outside and has the face of Red Bird on it to make it the perfect Angry Birds item. And like any good mug this Angry Birds mug is dishwasher and microwave safe. 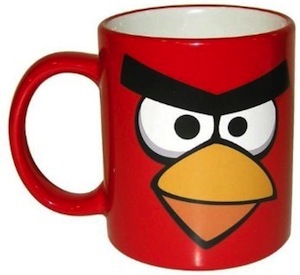 Have fun when coffee time comes around with this Angry Birds Red Bird Mug. Coffee out of a paper cup is so boring that you of course want a nice travel mug for when you go to work. 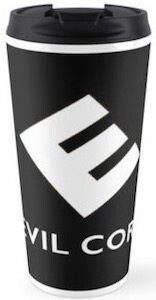 As a tech geek you want something that fits you and this stainless steel travel mug can be the one you are looking for. The outside of this mug is white (also comes in steel look) and shows USB ports on the top in a row going all around. 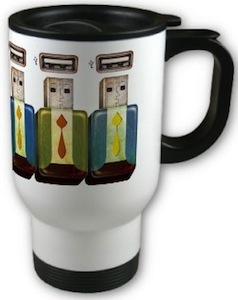 Below the USB ports you see USB flash drives ready to dock and they look like little men in suits with faces on the usb connector and it looks like they wear suits. This all makes it perfect for the office and fun because it has USB all over it. Come checkout this USB Travel Mug. Om Nom loves candy but if you put sugar in your coffee then he is happy to. Yes this coffee mug has a picture of you favourite Cut The Rope character Om Nom. And there is not just one Om Nom there are two one on each side of this amazing looking mug. The mug will hold of 11 oz of drinks and Om Nom is not picky he likes coffee, hot chocolate and tea as long as it has sugar because he loves sweets. 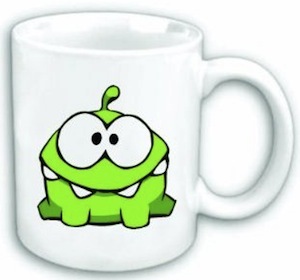 Cut the Rope fans come check out this fun Cut The Rope Om Nom Mug. If so be careful you never know what patents they stole to make this mug. 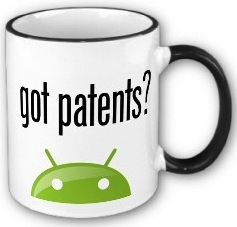 On this mug you see the top of the head of the Google Android logo and the words “got patents?”. And this print can be found on both sides of the mug. Also the handle and the rim are black but you can get it in Android green to. 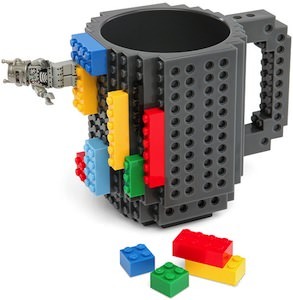 As the battle for patents in the mobile space is getting nastier everyday this mug really seems to hit the spot. So if you like to be part of all that then come and get your Android Got Patents? Mug.